Whether you’re moving to a new, larger home or find yourself downsizing to something smaller, proper preparation for your move can make a huge difference in eliminating stress. By taking the time to create a floor plan before you move, you save yourself from dealing with time-consuming decisions during an already hectic occasion. Metro Movers has been involved in hundreds of moves over our 30 years in business and we’ve picked up on some helpful tips and ideas along the way. 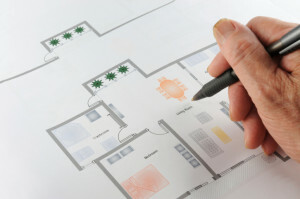 Here are some reasons why it pays to create a floor plan before moving. 1. Identify open spaces and gaps. It can be difficult to accurately determine how much space your furniture will take up when you’re standing in an empty home. When you take the time to create a floor plan that takes into consideration the actual sizes and shapes of your furniture, you’re able to identify open areas throughout your home. You might think that you have just the right amount of furniture to fill your new living room, for example, but if you don’t have an accurate floor plan, you may find yourself with an awkward gap that you hadn’t planned for. On the other hand, it can be just as easy to underestimate how much room you actually have and find yourself with a bunch of furniture that just won’t fit. Stop and map things out. Get the actual layout design and take pictures to give yourself a good sense of the space you have available. It’s even a good idea to take measurements of your new residence so you can compare it with the measurements of your furniture. Creating a floor plan can help you identify furniture or other possessions that just might not be able to make the move with you. This is especially true when you’re moving into a smaller place. Rather than ending up in your new home with a bunch of excess furniture that doesn’t have a place, you can make a purge before you move. Sell or donate items that won’t fit in your new place. 4. Be in charge when moving day arrives. When the day of the move finally arrives, your movers will be much more efficient when you’re able to clearly point out where furniture and other items belong. You’ll be able to direct and instruct those involved in the move based on your floor plan. This will not only save time, but can also prevent having to move pieces of furniture more than once. If you’re the type of person that is used to this level of preparation and organization, then you already know why you should create a floor plan before you move. But there are many of us out there that might not think it’s worth it. We challenge you to give it a try and see what a difference it can really make. Remember to call Metro Movers if you have any other questions or concerns about moving.